The August 2009 Daring Bakers' challenge was hosted by Angela of A Spoonful of Sugar and Lorraine of Not Quite Nigella. They chose the spectacular Dobos Torte based on a recipe from Rick Rodgers' cookbook Kaffeehaus: Exquisite Desserts from the Classic Caffés of Vienna, Budapest, and Prague. The Dobos torte has three main components: an incredibly light sponge cake, chocolate frosting that's so delicious it might as well be chocolate pudding, and a lemony caramel. Starting with the sponge cake, this was one of the best sponge cakes I've ever made! It held its structure well while still being light and tasty. We had the option to brush our sponge layers with some sort of syrup, and so I used an apricot syrup that I made a few weeks ago in the process of making apricot preserves. This added a nice tang and kept everything moist. I baked the sponge cake on a half-sheet pan covered in parchment paper and then cut it into six squares to make the six required layers of cake. Unfortunately, we didn't eat the cake until it was really dark out and too hard to get a good picture, but those layers of white cake and chocolate icing were gorgeous! The frosting was probably my favorite part of the challenge. Although it was definitely more than a little hard to work with, it was so delicious. The frosting is basically chocolate pudding enriched with lots of butter...so although it isn't very firm (which makes constructing a non-slouchy cake near impossible), it is so, so good. I will definitely be making this frosting again, but next time maybe for cupcakes or a sheet cake rather than a six-layer cake! Finally, I made the required lemony caramel. Because of reports of crunchy cake layers, I abandoned the step of soaking one of the cake layers in caramel in favor of dipping hazelnuts in the caramel. I dipped whole hazelnuts in caramel for the top and then poured the remaining caramel over the not-so-pretty hazelnuts and chopped them up to decorate the sides. This whole component didn't work out so well. The hazelnuts were a huge pain to peel, which is why I only succeeded in peeling seven of them for the top! The rest just refused to release their skins or broke in half when I was peeling them. The caramel also wasn't my favorite. It was hard to get it dark enough, I think because of the high water content...as you can see in the above photo, it's not very dark at all. Perhaps because the caramel flavors didn't come through well, the end result was just too lemony for my taste. However, with the whole cake assembled, this component added a nice crunch and was tasty. Overall, I loved this challenge! This is one I definitely would not have made on my own, but I loved the end result (and it made for a really impressive presentation at a dinner party!). Thanks to our hosts for another fantastic challenge! You can find the recipe at A Spoonful of Sugar. This salad is the perfect use for those pears that aren't ripe enough to eat out of hand. Our grocery store only seems to carry pears in two varieties: hard and rock hard. Of course, I could put them in a paper bag and wait a few days, but knowing me this will likely lead to the discovery of a rotten pear in 2-3 weeks! Roasting the pears is a great solution. They become soft and sweet, and perfectly delicious in this salad. I wouldn't try this with totally unripe pears, but with pears that are getting there but still too firm to eat, it seems to work well. The sweet pears pair (hee!) well with bitter greens and a light vinaigrette. Feel free to sub in your favorite bitter greens for the watercress. As always, you could jazz up the salad with some goat cheese to make it extra special, but it's a winner even sans-cheese. 1. Preheat the oven to 425 degrees. Peel the pears and slice each into 8-10 thick slices. Toss with olive oil, salt, and pepper and roast in the oven for 15-20 minutes until soft and caramelized. Flip the pears over with a spatula once during roasting. Allow to cool for at least 15 minutes before making the rest of the salad. 2. Place the shallot, vinegar, honey, salt, pepper, and olive oil into a jar with a tightly fitting lid. Screw on the lid and then shake vigorously until all the ingredients are combined. Taste and add more honey, salt, and/or pepper as needed. 3. 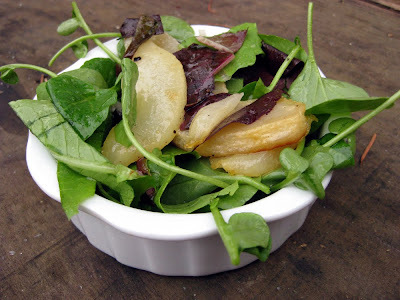 Place the pears in a salad bowl along with the watercress and baby greens. Add about half the dressing and toss to combine. Add more dressing as desired and pass any extra at the table. We have a plum tree in our backyard, but only recently realized that the plums are actually edible! (We had thought they were ornamental because they're very small, but actually they're quite tasty!) I decided to turn some into an easy ice cream. I roasted the plums with muscovado sugar and then blended them with half-and-half and more sugar for a not-too-sweet, creamy dessert. You could add more white sugar if you want a sweeter ice cream, but I thought the balance with the strong flavor of the muscovado was perfect here. Plus, look at that color! So, so pretty. The ice cream was good on its own, but what I was really after here was an accompianment to sweet desserts, another reason I wanted to keep the ice cream itself from being overly sweet. 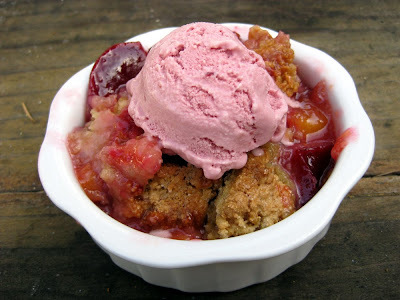 The roasted plum ice cream was terrific with brownies, as well as the stone fruit crisp pictured below (recipe coming soon). It was also tasty with one scoop of this paired with a scoop of sugar-y dulce de leche ice cream. Yum! 1. Preheat the oven to 400 degrees. Cut the plums in half and remove the pits. Place them all face-up in a baking dish and sprinkle with sugar. Roast until the plums are soft and have released their juices. 2. Allow the plums to cool slightly, and then place the roasted plums, along with any juice in the pan, in a blender and puree. Add the sugar and half-and-half and blend until very smooth. Taste and adjust for sweetness. 3. Pour the plum mixture into a small bowl and chill in the refrigerator until cold. Freeze in an ice cream maker according to your ice cream maker's instructions. Reinhart's ciabatta was absolutely amazing. 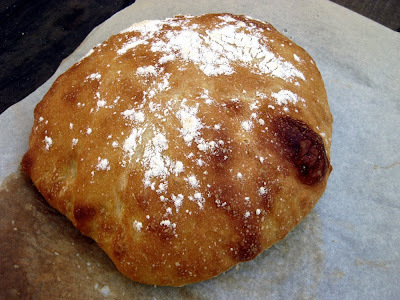 I made a sourdough variation, substituting sourdough starter for the poolish called for in the recipe, and the sourdough flavor added a lot of depth--absolutely amazing flavor! 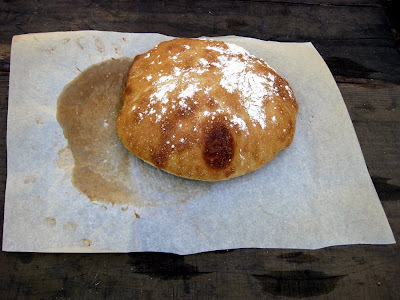 I made the dough really, really wet on the advice of other BBA challenge folks -- maybe even too wet as it was hard to do the stretch-and-folds called for by the recipe, and the dough stuck to everything! However, I was rewarded with huge holes and an excellent texture, so I was happy. We had the bread with pulled pork, homemade BBQ sauce, and collard greens; it was the perfect accompianment! Next up was cinnamon buns. Cinnamon buns are one of those recipes I've been wanting to make forever but never quite managed to get to, so I was delighted to get to this page in the book! I found the recipe a little on the tough side, so I think I'd probably go with a different recipe next time to get that really pillow-y Cinnabon texture. 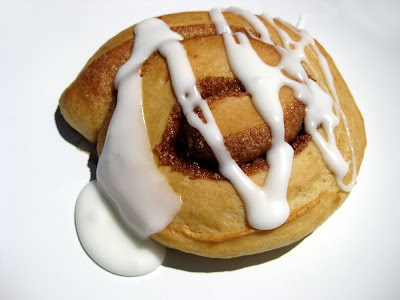 Stil, the flavor was fantastic and the cinnamon buns didn't last too long in our house! I didn't manage to get photos of the next two recipes, cinnamon-raisin-walnut bread and cornbread, but they were both very delicious. I made half the cinnamon-raisin bread with walnus and half without, because I have a housemate who's not a huge fan of walnuts. I liked both versions, and even though you might think of this as a breakfast bread, it was actually also really good on either side of peanut butter and jelly for lunch. PR's cornbread is just the way I like it, sweet, salty, and ultra-moist. It's almost like a corn pudding, and was the perfect side dish alongside my housemate's jambalaya. I love that the cornbread has plenty of bacon, honey, actual kernels of corn. Some fellow BBA-ers weren't a fan of this one, but I think it's somewhat a matter of taste. To me, this is an ideal cornbread! It's also totally easy to tweak if you decide you want to make it, say, immediately: warm some milk, add lemon juice to curdle, and then quick-soak the polenta for just about half an hour while preparing the rest of the ingredients. As promised, here's another sour cherry recipe I made with canned sour cherries, the only sort that seems to be available here in California. Although the cherries weren't as sour as I wanted, this crisp was still entirely delicious! 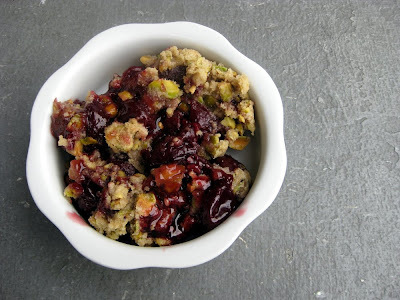 The less-than-perfect cherries were perfectly complemented by the salty, crunchy pistachio topping. 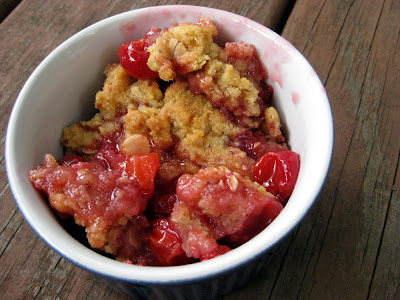 I will definitely be using this topping again on other fruit crisps, either with cherries or other fruits. 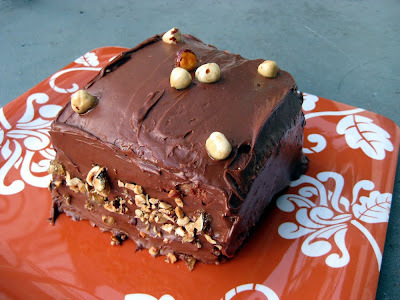 It was actually this recipe that inspired me to get the Sweet Melissa Baking Book in the first place! When it popped up all over the blogs as part of Sweet Melissa Sundays, I just knew I had to try and and see what other recipes were inside. Although this is the only one I've tried so far, I'm looking forward to baking some more in the near future! 1. Preheat the oven to 350 degrees. Spray a smallish baking dish with oil and set aside on a half sheet pan. 2. Make the topping first. Whisk together the flour, oat flour, sugar, cinnamon, and salt. Pour in the butter and stir together with a fork until everything is combined. 3. Make the filling in a separate bowl. Mix all the filling ingredients together and then pour into baking dish. 4. Crumble the topping over the filling. 5. Bake about 45 minutes until the filling bubbles and the topping is nicely browned. When I visited my parents in Ohio earlier this summer, we were lucky enough to spot some frozen sour cherries at the grocery store. I'd been craving them for quite a while and even made some sour cherry crisp with canned sour cherries (which I'll be posting later this week), but it just wasn't the same. I don't really understand why frozen sour cherries aren't available everywhere--after all, there are plenty of non-local fruits that get frozen and shipped everywhere! And they're so delicious, I can't believe they wouldn't sell, especially in a foodie-heaven sort of place like Berkeley. Yet every time "sour" cherries get sold here, they seem to be slightly-less-sweet sweet cherries. In any case, I was delighted to find the frozen cherries in Ohio, and the crisp did not disappoint! It had that perfect sour cherry taste I remember from when I was a kid, almost mouth-puckering cherries in a sweet sauce. These cherries need only a simple topping to complement them perfectly. If you do have access to fresh or frozen sour cherries where you live, don't let this recipe pass you by! 1. Preheat the oven to 375 degrees. Let cherries thaw, if frozen, and then drain. Discard the liquid or reserve for another use. 2. Whisk together the almond meal, flour, oats, baking powder, and 1/4 tsp salt. Set aside. 3. Cream together the butter, brown sugar, and 1/4 cup white sugar, either by hand or with an electric mixer. Stir in the almond mixture until everything is well mixed. 4. Prepare the cherries. Stir together the cherries, 1/2 cup white sugar, cornstarch, and a pinch of salt in a bowl. Pour into an 8x8 square baking dish. 5. 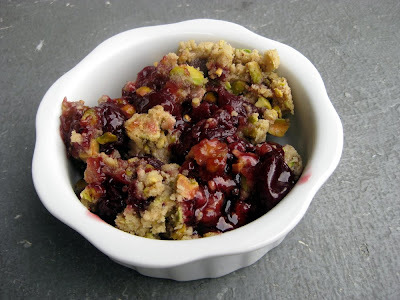 Using your fingers, pinch the topping over the cherries in small pieces, covering the whole pan with the topping. 6. Baking until the filling is bubbling and the topping is browned, about 50-60 minutes. Cool slightly before serving. Vanilla soft serve is an excellent accompaniment. My housemate and I made this tasty summer pasta dish with lots of fresh veggies from the farmer's market. We snagged some fresh sweet pea pasta, which was amazing with all the vegetables, but any fresh pasta would be tasty here. 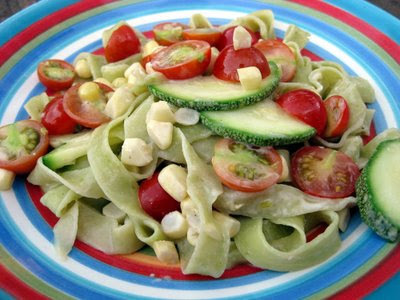 Cherry tomatoes, sweet corn, and summer squash provided the perfect balance of tangy acid, sugar, and mild zucchini. A bit of goat cheese rounded things out, making the dish just slightly creamy. Add more goat cheese if you want a stronger cheese flavor. 1. Heat a bit of olive oil in a large pan. Add the squash and corn kernels, and saute until just tender. 2. Meanwhile, bring a large pot of water to a boil. Salt well, and then cook the pasta for just 90 seconds. Drain, and return to the pot. 3. Add the squash, corn, and cherry tomatoes, and stir to combine. Add the cheese and vinegar, and stir until the cheese is melted. Season with salt and pepper.